Try using ingredients already in your fridge for toppings! Preheat the oven to 400F, or use a small toaster oven and skip preheating. Cut your English muffins in half and lay them on a lined baking sheet, cut side up. Add 1 tablespoon of sauce to each mini pizza crust (8 total), then a big pinch of mozzarella cheese. Next, load each mini pizza with your favorite toppings (about 2 tablespoons of toppings each). Finally, add another tiny sprinkle of cheese to hold everything together after it’s melty. Bake in a preheated 400F oven for 5-7 minutes, OR toss them in your (not preheated) toaster oven and bake at 400F for 9-10 minutes. Let the mini pizzas cool completely, then portion into airtight containers and store in the fridge. I prefer two mini pizzas for each meal, plus a side of fresh cut veggies or a salad. These are delicious cold!! But if you want to reheat: Place in a toaster oven and bake at 400F for 4-5 minutes until the cheese is melty; or microwave for 30 seconds (may get soggy this way). 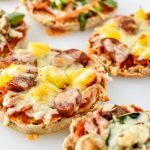 These mini pizzas can be frozen: After cooking, freeze them separately on a baking sheet for at least 4 hours, then store them in a Ziploc or freezer safe container for up to 3 months. To reheat from the freezer, place in a toaster oven and bake at 400F for 12-15 minutes, or until completely heated through. You can also leave them in the fridge to thaw overnight, and then eat cold or reheat as mentioned above. Nutrition information estimated with MyFitnessPal and only includes two pepperoni mini pizzas (no sides).